Today I have a look at one of the Hard Candy sets that will be out for the holiday season. 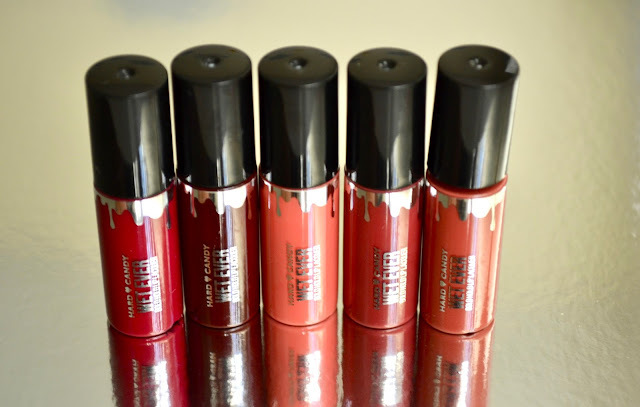 It has a variety of lip products from Hard Candy including: Bold Hold Lip Lacquer, Matte Lip Color and Matte Metallic Lip Color. You get 20 shades to choose from and they are mini sized but enough to get a more than a few uses out of. 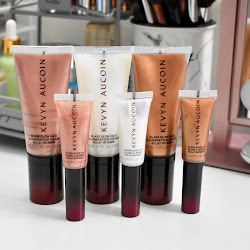 See swatches below! The first row of lip products are the Hard Candy Wet Ever Lip Lacquers. There are 5 different shades which I don't know the names to. 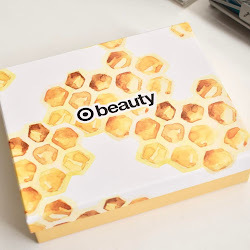 The packaging doesn't say what shades you get which is a bummer because I would love to know what they are. If I am going by what I see on the Hard Candy website, I would say: Devious, Entitled, Selfish, Famous and Genius. Either way, they are all really nice shades and super pigmented. 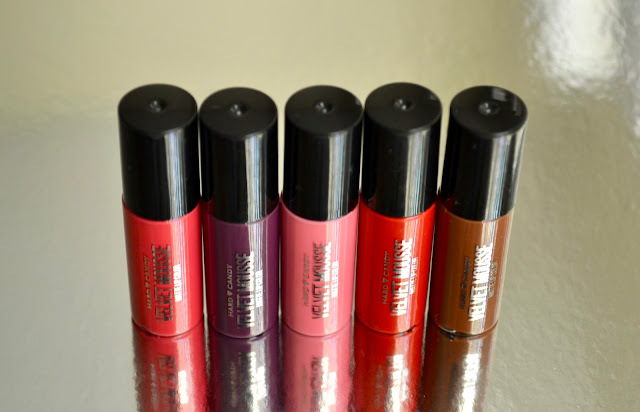 I do like the wet shine finish to them and prefer this kind of product on the lips. 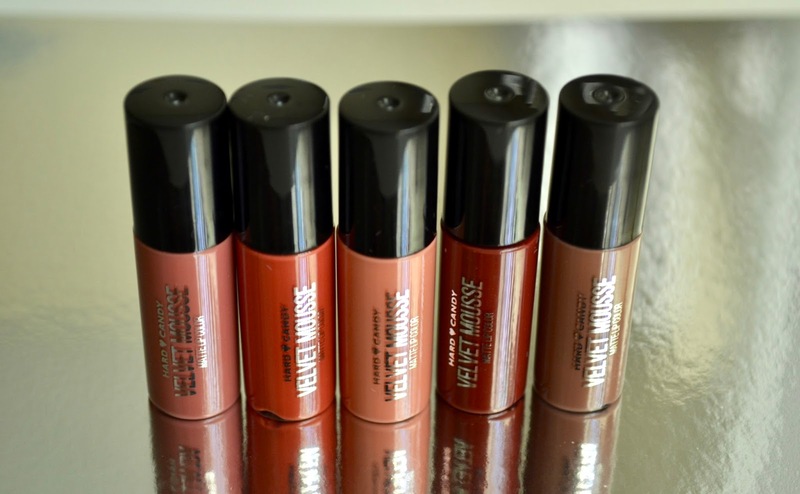 The second row in the collection is part of the Velvet Mousse Lip Colors. There are two rows of these and this row has some nice looking fall shades. I really love this row of lip colors. They are matte which you can more tell by the first swatch (the others were still drying down). None of the shades lack in pigment in this entire set. These are a little harder to guess their names since there are more shades to choose from on the website. 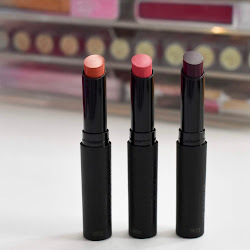 The Hard Candy Velvet Mousse Lip Colors are really comfortable to wear on the lips and have some great staying power. These shades are a bit more bright, but I love that there is a good mix of different colors in the set. The only shade that is not that flattering on me is the middle pink shade. So out of everything so far, that's not bad. 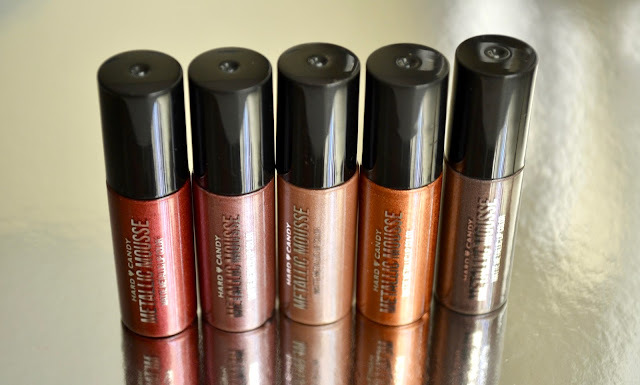 Last in the set are the Hard Candy Metallic Mousse Lip Colors. The shade I believe are: Queen of Hearts, Truffle, Sandstorm, Sweet as Honey and Smoke & Mirrors. These are great for the holidays and the metallic finish is not gritty or uncomfortable. The shades I like the most from the Metallic Mousse are Queen of Hearts and Sweet as Honey.